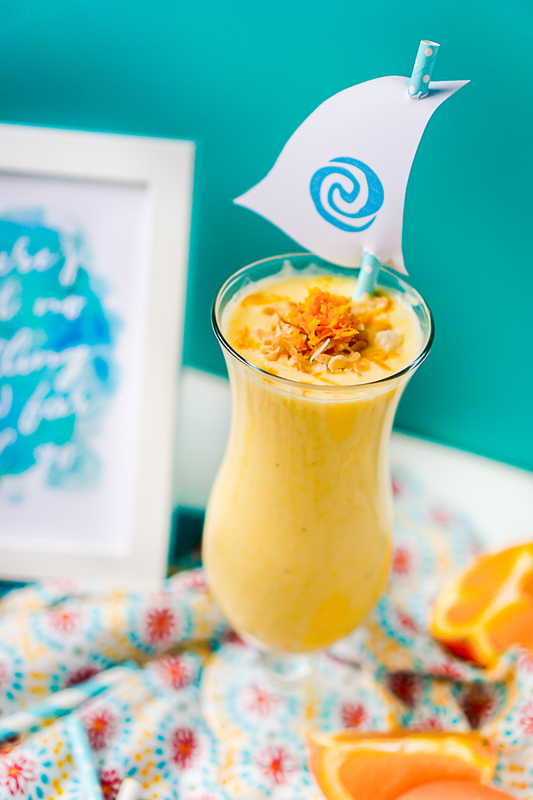 “Moana, Consider the Coconuts” Orange Pineapple Coconut Smoothie Recipe is aflavorful, citrus smoothie that will make you think sun and warmth all year long! 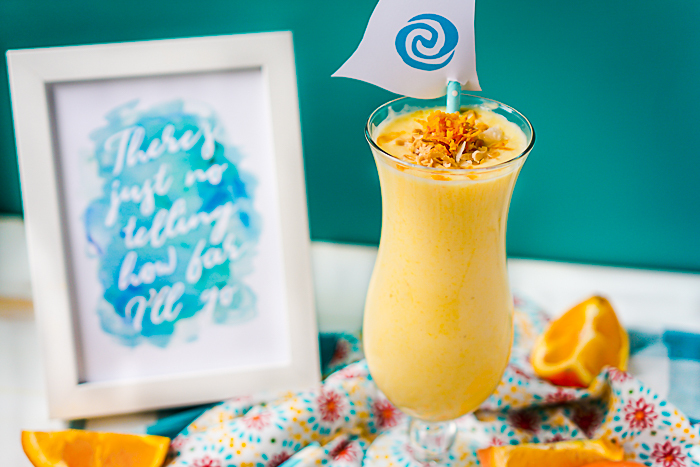 “Consider the Coconuts” While Watching Moana and Sipping on this Tasty Orange Pineapple Coconut Smoothie!! Telling you that I love Moana is such an immense understatement. I’m a Disney girl through and through, always have been, so the likelihood that I would enjoy Moana was pretty high. Our in-laws offered to babysit the day after Thanksgiving, and we debated which movie we wanted to go see. There were a lot of big dramas out at the time, many of which were then nominated for the Oscars, but Moana inevitably won out because as tired new parents with a 7 week old, we just wanted something fun and uplifting. What we got was a movie that brought us to tears – a movie about loss, about finding yourself, about following your heart and passion, and about standing up to RISE (my word for this year) despite the overpowering odds. Yes, we loved Moana, so celebrating it through a blog hop with my fellow pop culture bloggers was an easy decision. Therefore, I bring you an Orange Pineapple Coconut Smoothie! “Moana … Consider the Coconuts!” The songs in this movie are so catchy that Liam and I often find ourselves hosting one sided sing-a-alongs to the album during the day (the 5 months old can’t sing but he does offer big grins!). Singing “You’re Welcome” when I change a diaper or offer him a bottle and “How Far I’ll Go” when I need a little inspiration to keep going. My favorite line from that latter song is “There’s Just No Telling How Far I’ll Go!” This is a message I hold close right now with rise being my word for this year. I am taking on some new challenges, putting myself out there in a new way and testing my limits. When you are pursuing your dreams, you just never know where it will take you! We also really love singing “Where you are”, and Liam always grins widely with the phrase “Consider the Coconuts!” He must just love the sound of the words or maybe I look extra goofy while singing those words. So when deciding what to post in honor of Moana, I had to consider the coconuts! 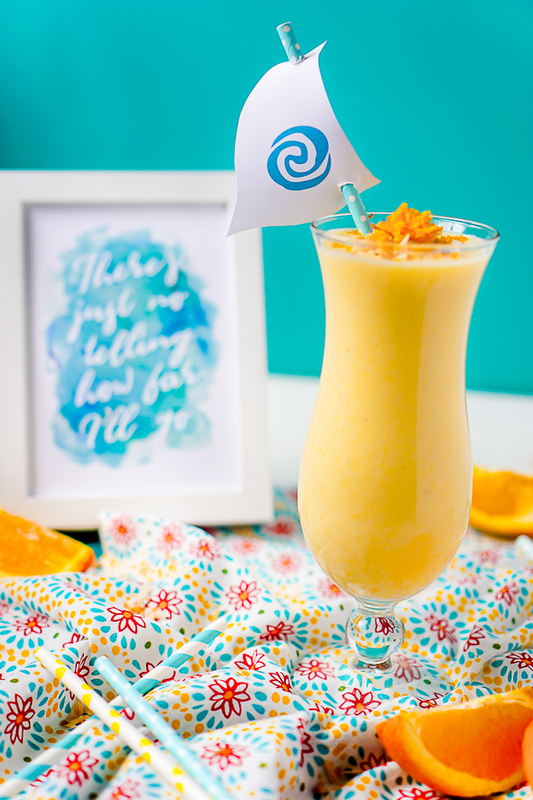 This Orange Pineapple Coconut Smoothie is filled with citrus goodness and offers a little taste of sunshine in a glass (Maybe I’m feeling a little cheesy today). This smoothie recipe will definitely be a favorite of mine this spring. There is just something about the combination of coconut, pineapple and orange that makes me think warm weather and pool side afternoons. It might still be cold here in Chicago, but this smoothie makes me think warmer weather and sometimes that it all I need! 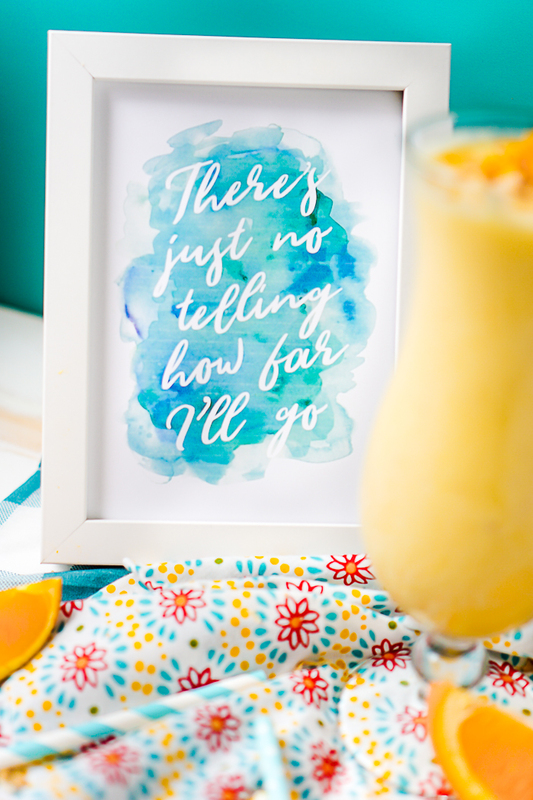 "Moana, Consider the Coconuts" Orange Pineapple Coconut Smoothie Recipe is aflavorful, citrus smoothie that will make you think sun and warmth all year long! Add all the ingredients into a blender and blend until smooth. Enjoy!